The first eBook “Top Tips for Successful painting” has been sent to those who kindly filled in my survey and will be available in my online store once it is up and running. The next eBook is almost ready for release. This is titled ” Photo References, Choosing, Editing and Using Them. Landscape Edition” and is full of useful information to help you with using photos for your paintings. Some of my new paintings will be featured, showing how I adjusted the reference photo, changed elements and made my own colour choices. 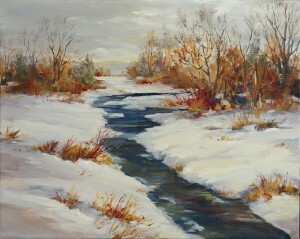 This is one of the paintings: “Winter Creek”. Hi Marianne, I am struggling with having time to keep painting. Have signed up for the Fall images tour, not sure if I will get in or not yet. 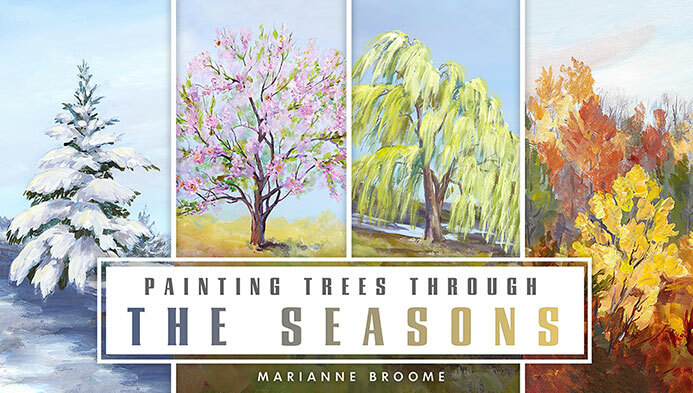 I am in the Barrie Spring Art tour for April. I enjoyed meeting you and am still interested in the water based oil paints, if you still have them. I have some time to make arrangements to meet with you, perhaps I can come to your studio and visit. The horses are still here and I will be starting a program for women to join up with the horses for healing and encouragement. Hope to see you soon! I haven’t got a website yet, but my artist logo is Dark Horse Artistry.